It’s time for the 15th annual WMPG Fashion Show… the grassroots, quirky, funky, ‘can’t quite believe it’ festival of wearable art created by local designers. From wild to normal, street to formal, the WMPG Fashion Show presents all styles of clothing, jewelry, accessories and artistic wear for all ages and genders! Want to learn more about your favorite WMPG DJs? Here is a video look into what makes our DJs so special. First up let’s meet Ad vs EF with DJs Matt Perry and Sean Gear. They talk about their show and then you are taken into the On-Air room and watch them produce the show. Volunteer DJ Jai has created video profiles of the WMPG DJs. National Radio Day @ WMPG on August 20th! Can we hear from you? If you love radio and especially if you love WMPG, we’d like to invite you to participate with us in National Radio Day on Sunday August 20th. Across the country stations will be celebrating radio – your source for great music and talk produced by members of your community. We are looking for testimonials and Facebook posts on why you love radio and what WMPG means to you. On an otherwise quiet Wednesday morning, 43 students from Peaks Island School filled the studios of WMPG Community Radio. The students will be a part of the Saturday morning “Chickens R People2” broadcasts on June 3 and 17, and came for a short but fun visit in preparation for their shows. WMPG’s 2017 Cajun Cookin’ Challenge winner is Sodexo USM Dining! Fat Tuesday at WMPG is a highlight of the year, as hundreds gather on USM’s Portland campus to taste Cajun inspired cuisine and groove to New Orleans inspired music! 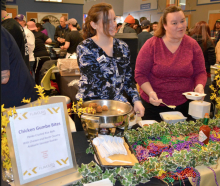 On February 28, WMPG held it’s 22nd Fat Tuesday Cajun Cookin’ Challenge at Woodbury Campus Center. Over 500 attendees tasted the Cajun creations of nine local food establishments, and then voted for their favorites. WMPG’s Two Day “Production Studio Re-Do” raises over $6,200! A huge thanks to everyone who donated or attended this past Friday and Saturday to WMPG’s “Production Room Studio Re-Do” pledge drive and CD/Record & BBQ. With all the donations now added up we raised over $6200. Thanks especially to all the WMPG volunteers who made it all possible. The DJ’s themselves have already donated more than $10,000 to this project and with grant money received from the Maine Association of Broadcasters and now money raised this past week we are over the $28,000 mark and making our way to the $64,000 needed to complete our “Production Room Studio Re-Do”. Welcome Jessica Lockhart – WMPG’s new Program Director! We are happy to report that Jessica Lockhart has been named WMPG Program Director. Her official start date began on May 16th. For those of you not familiar with Jessica, she has a long history with WMPG and USM. She currently is a USM Media Studies Instructor for Audio Production. 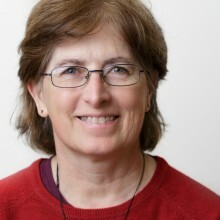 For WMPG she has taught classes in Hindenburg and Audacity, assisted us with managing our Begathons and previously served as WMPG Program Director. She also helps with training the incoming Blunt Youth Radio participants each year. Amy Goodman, host and executive producer of the award winning independent daily news program “Democracy Now!” will speak in Portland on Saturday May 14, at Portland High School’s Ford Auditorium. Doors open at 1pm, and her talk begins promtply at 2. There will be a book signing at Portland High following the event. 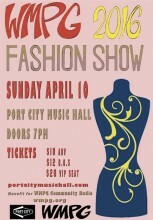 WMPG’s 12th annual WMPG Fashion Show Sunday April 10th at Port City Music Hall! Local designers of wearable art for women, men and children will show their most creative fashions on the WMPG runway on Sunday April 10th, 7pm doors, 8 pm show at Port City Music Hall. Artistic Director Cindy Flanders reports that this year’s show includes works from new and returning designers. Styles run the spectrum from formal to street. Statement Jewelry pieces, repurposed, up-cycled and embellished clothing as well as vintage inspired garments. WMPG’s Fashion Show strives to include a wide-ranging and energetic collection of the talent & creativity that is thriving in Maine.